As usual, I’ve been trying to finish all my work and get a lot of things done before starting the holidays. There have been long lists of to-dos, but luckily I came to my senses about doing a big clean-up before pulling down all the clothes from our closets. I managed to realise that I don’t have to get it all done and things can wait. 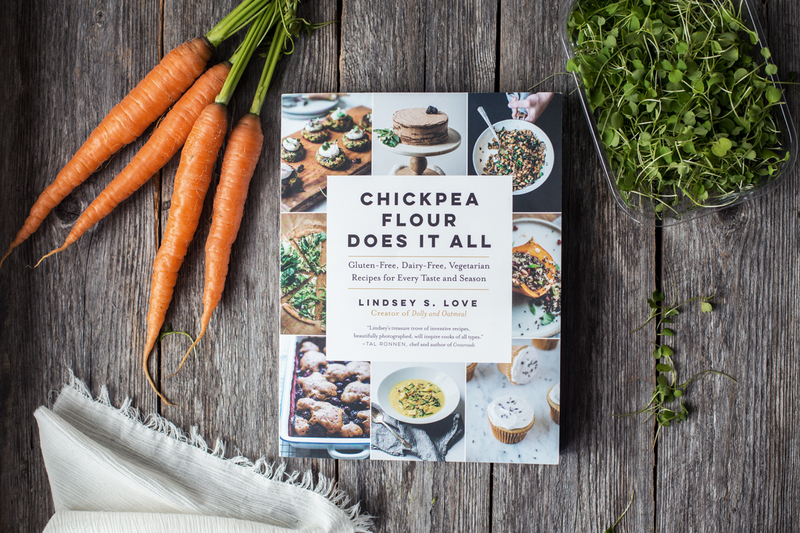 There was one thing though I really wanted to do before taking off, and that was to blog about Lindsey’s new book, Chickpea Flour Does It All. I don’t remember when I stumbled into Lindsey’s blog, Dolly and Oatmeal, for the first time, but it quickly become one of my favorites. I love her photography and food styling, and her recipes are really innovative and inspiring, as she always seems to come up with something new and exciting. Same goes for the book, which is filled with so many delicious things, all with chickpea flour in some role. There were a bunch of things I wanted to try, but hence the long to-do lists and my need to clean out the fridge, I decided to go for something simple and made the Chickpea Omelet. I’ve been experimenting with chickpea flour a few times but haven’t made omelets before. I’m so glad I made them now, as they were delicious, super simple to make, and there are endless options for fillings. The original recipe had scallions and shiitake mushrooms, but as I’m not really a fun of mushrooms I replaced them with more vegetables and used thinly sliced zucchini and carrot. 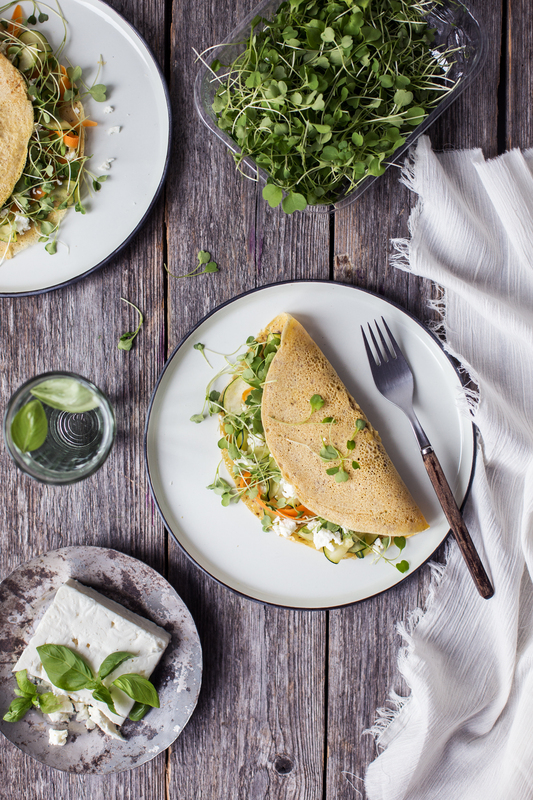 I also added some feta cheese because I just love the taste of it in omelets. To keep the whole thing vegan, you can just skip the cheese or go wild and make an almond-based vegan feta (!) that Laura just blogged about. And if you’re up for some additional cooking, these would be great with some hummus or some other dip. 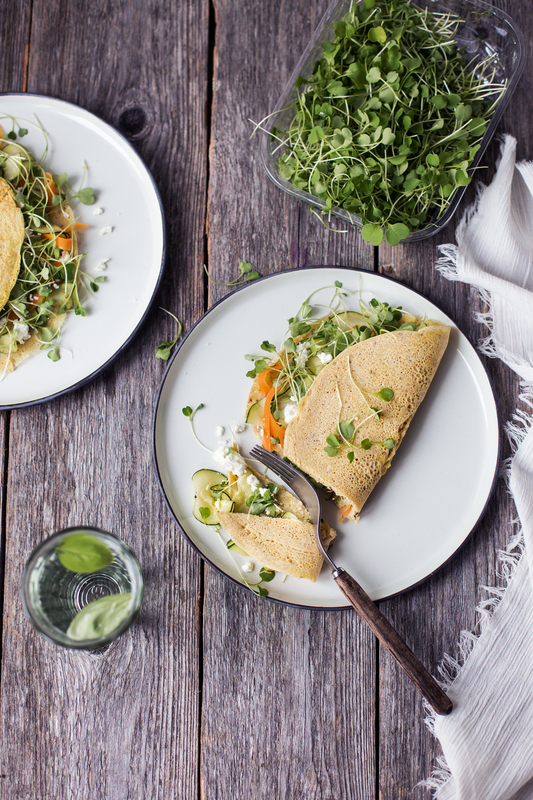 I’m also planning to use the leftover omelets to make veggie-filled burritos. Boom! So much goodness. notes: the original recipe uses rice vine vinegar but I didn’t have it, so I used apple coder vinegar instead. feel free to use either one you have at hand! 1. In a small bowl, whisk together the flaxseed meal and 3 tablespoons of water. Set aside for 10 minutes to thicken. In another bowl, whisk together the chickpea flour, salt and pepper. Add 1 cup of water and the vinegar, and stir well. Mix in the flax mixture and set aside. 2. Cut the zucchini into very thin slices with a knife or with a mandolin slicer. Peel the carrots and cut into very thin stripes with a vegetable peeler. Heat a pan over medium heat. Add a bit of olive oil and cook the vegetables for a couple minutes, until softened. Season with salt, black pepper and dried basil. Remove from the heat and set aside. 3. Cook the omelets. Add a bit of oil to the pan and pour a few tablespoons of the batter to the pan, swirling to cover the bottom. Let the omelet cook for 1 to 2 minutes, until you see bubbles appear in the center and on the sides. Flip the omelet over and cook for another 30 seconds to 1 minute, until lightly browned. Remove from the heat, place on a plate and cover with a kitchen towel to keep warm. Repeat with the remaining batter, until it’s finished. 4. 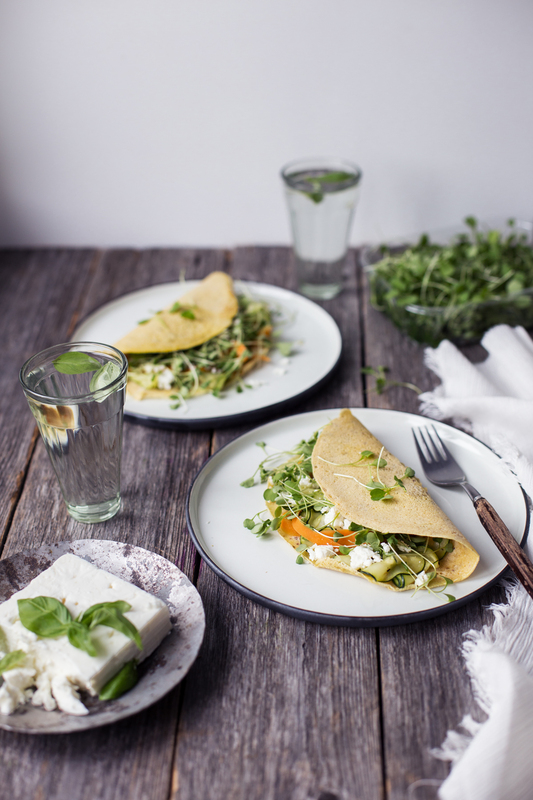 Fill each omelet with the cooked vegetables, a handful of crumbled feta cheese and some microgreens. Serve and enjoy! Tagged breakfast, grain free, lunch & dinner, vegan, vegetarian. Loaded with berries and summer fruits, this Summer Bircher Muesli is the perfect breakfast for busy mornings and on-the-go – and it's quick to prepare! Blueberry Pie is a summer classic! This gluten free and vegan version is very simple, and tastes great as it is or with some homemade vegan vanilla ice cream.